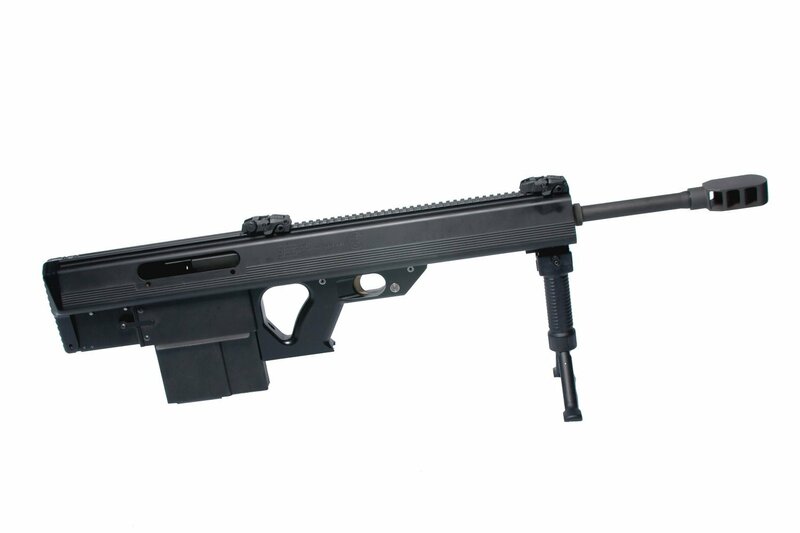 Leader 50 BMG Revolutionary Ultra-Compact and Lightweight Semi-Auto Bullpup .50 BMG (12.7x99mm NATO) Anti-Materiel/Sniper Rifle for Military Special Operations Forces (SOF) and Civilian Tactical Shooters: Coming Soon to a Theater of Operations and Shooting Range Near You? | DefenseReview.com (DR): An online tactical technology and military defense technology magazine with particular focus on the latest and greatest tactical firearms news (tactical gun news), tactical gear news and tactical shooting news. 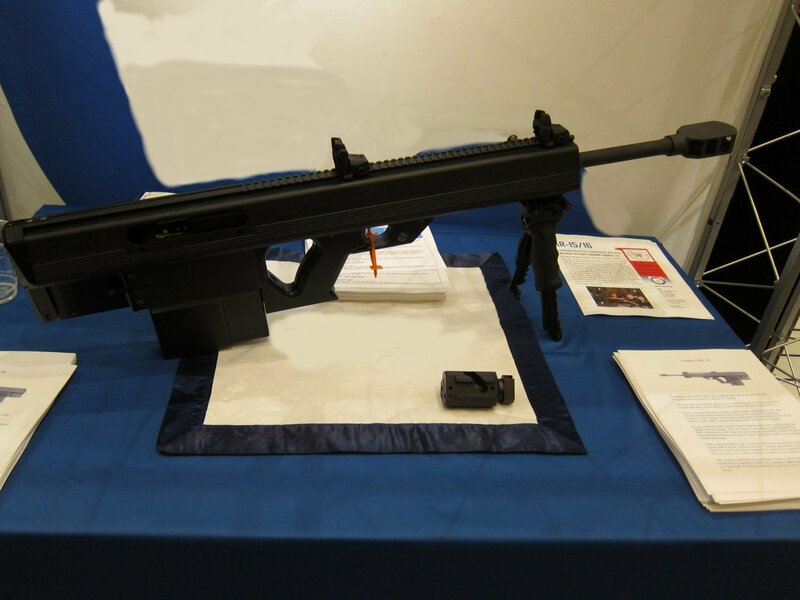 Leader 50 BMG Revolutionary Ultra-Compact and Lightweight Semi-Auto Bullpup .50 BMG (12.7x99mm NATO) Anti-Materiel/Sniper Rifle for Military Special Operations Forces (SOF) and Civilian Tactical Shooters: Coming Soon to a Theater of Operations and Shooting Range Near You? The top two photos contained in this article were taken by DefenseReview.com, and are copyrighted. DefenseReview.com owns the copyright on these photos. The photos were shot with a Canon PowerShot S90 10-megapixel digital camera (still camera with video capability). The bottom two photos are courtesy of Leader Propulsion. A company called Leader Propulsion recently displayed a prototype revolutionary ultra-compact and lightweight semi-auto bullpup .50 BMG (12.7x99mm NATO) anti-materiel/sniper rifle called the Leader 50 BMG at SHOT Show 2011 that really blew us away (excuse the pun) when we viewed and handled it at the booth. Mark our words, the Leader 50 BMG has the potential to become the single most effective and viable semi-auto .50BMG anti-materiel/sniper rifle for military Special Operations Forces (SOF), period, provided the production version proves to be accurate, reliable, and durable under high round count and adverse conditions, and features a good trigger. DefenseReview (DR) believes that the Leader 50 therefore potentially represents the most important development in .50 BMG anti-materiel rifles since the introduction of the Barrett M82A1 “Light Fifty” rifle 29 years ago, provided it performs as advertised. The Leader 50 BMG bullpup semi-auto rifle will be signficantly shorter/more compact, lighter, and, the company claims, more accurate than the Barrett Model M82A1 and Barrett M107A1 .50BMG anti-materiel rifles. The Leader 50 BMG rifle, which will also be availabe to law enforcement personnel and civilian tactical shooters, will have an overall (OA) length of only 39 inches (39″), while allowing the operator to utilize and enjoy a 24-inch (24″) barrel (that’s the advantage of a bullpup! ), and will weigh approx. 17 lbs dry/empty. It will therefore be ultra-portable and capable of being deployed from vehicles. And, here’s the kicker, according to Charles St George, the weapon’s designer, the Leader 50 BMG generates less felt recoil than a M1 Garand semi-auto .30-06 Springfield battle rifle! The Leader 50 operates via short-stroke gas piston/op-rod (operating rod), and features a 10-round magazine capacity. The weapon is scheduled to be available sometime around September 2011, and is expected to cost around $6,800 USD. It will be manufactured by Micor Industries, NOT by the seriously troubled Sabre Defence Industries (SDI). “David it was nice chatting with you and hope to see you soon. I am including some information for you to add to your copy and suggested headings. The Leader 50 BMG (trademark) shown at the recent Shot Show  attracted a huge interest from the US, as well as the overseas market, including strong military enquiries. The LSR 50 designation has been dropped since it will not be produced by the now defunct Sabre Defence. 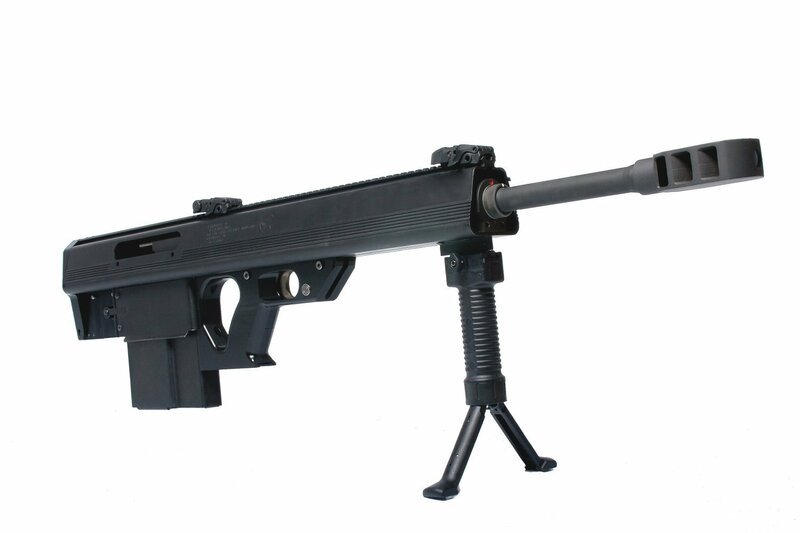 The Leader 50 BMG will be produced by Micor Industries. Designed by Charles St George, resident of Murfreesboro TN, the Leader 50 (several patents pending) is an evolution in small arms firing the .50 BMG round and its design is like no other weapon, with the exception of the triangular breech bolt and extruded receiver, now a recognized St. George design trademark dating back to 1978 and 1986 respectively and used on the Barrett 82A1, Serbu BFG-50 and Bennelli R1. A 3-position gas regulator including a gas shut off is positioned surrounding the barrel, providing a straight rearward thrust minimizing muzzle climb. This gas sysytem design, plus the efficient brake and low-recoiling mass reduces the recoil impulse down and comparable to a Garand 3006. Unlike the current .50 BMG weapons on the market, the Leader 50 BMG does not use any castings, MIM parts, or unsightly weldments, and offers a sleek design with an easy to manage weight distribution, allowing for a compact overall length of only 39 inches and a full 24-inch (24″) barrel. The short breech mechanism and side-mounted trigger mechanism contributes to its reduced overall length and balance. Of interest is the use of Maraging Steel for the bolt and barrel extension, eliminating the headspace concern encountered on other rifles of this calibre. Huge gas vents are provided to direct any escaping gasses away from the shooter should a rupture case inadvertantly be encountered. 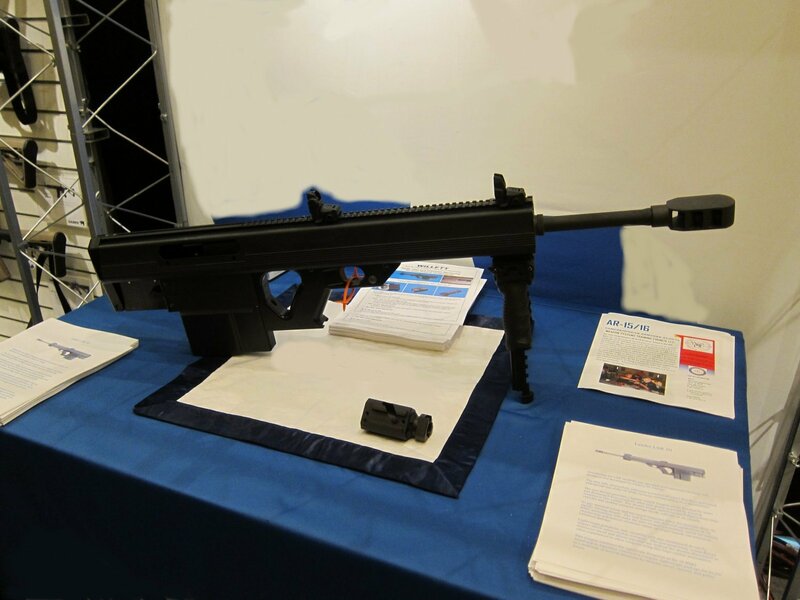 The Leader 50 BMG will be exhibited and demonstrated at the up coming NDIA small arms exposition [International Infantry & Joint Services Small Arms Systems Symposium, Exhibition & Firing Demonstration 2011] in May 2011 [5/23/2011 to 5/26/2011]. Hopefully, by this time next year, U.S. military SOF personnel will be using the Leader 50 BMG to shoot enemy combatants out of their sandals. Fingers crossed. Oh, and Leader Propulsion will be following up with .338 Lapua and .408 CheyTac caliber versions of the Leader 50 rifle, using the same weapons platform/design, and they will most likely be introduced at SHOT Show 2012. Desert Tactical Arms (DTA) Stealth Recon Scout (SRS) Covert Compact Bullpup 7.62×51mm NATO (7.62mm NATO)/.308 Win. Sniper Rifle for Military Special Operations (SPECOPS): First Test! Ultra Mag 50 .50 BMG Rifle: Heavy Punch in a Lightweight Package.